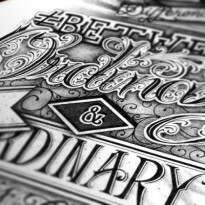 Looking to get that fresh-off-the-press, inked look for your type or vector artwork? Learn how to age your type, or any vector shape, in 6 simple steps with Adobe Illustrator CC! So let’s start with opening a new document, any size, and typing something out. In this tutorial I’m working with Drone Ranger Display Font at roughly a 90 pt size. I’m using this font in particular because it has lots of sharp, chiseled edges which is great for the effect we’re trying to get. Now you’re going to go ahead and hit ‘A’ on your keyboard to select the ‘Direct Selection Tool’. With that, you can select any of the corner anchor points and a little blue circle within another blue circle will pop up. You can either double-click this circle to bring up the radius box, and proceed to edit the options in there, or you can just click & drag that circle to round off the corner. You’ll want to make sure to round off ALL corners to keep everything cohesive. Some are easy to miss. But once you’re done you’ll have a similar effect to the example above. The next step is to select your type or shape and hit Ctrl + H (PC) or Cmd + H (Mac) to hide your shape’s outlines. We’re doing this so we can really see what this next effect is doing to our type. Now, in the above menu, select Effect > Distort & Transform > Roughen. Once that window pops up, you can play with the settings as you’d like, but I’ve also attached the exact settings that I used for a reference point. As you can see, the Roughen effect can create some weird anchor points when you’re dealing with extreme angles so we’re going to select the smooth tool from the menu and begin to clean up these glitchy anchor points by selecting our type (with our outlines still hidden) and just drawing around them with the smooth tool to smoothen them out. So now that we’ve got the basic shape of our type looking a little more hand-drawn, or inked, we’re going to add some texture. There are lots of vector textures online that you can use, like these ones that we’re going to use in this example which you can download for free. Open up the textures, and bring them into this project. You can shrink them, duplicate them and overlap them, do whatever you’d like to create the effect that you’d like to keep. Now you’re going to select all of the textures that are over your type or shape, and hit Ctrl + 8 (PC) or Cmd + 8 (Mac) to turn them into a compound shape. Now select your type or shape, and do the same thing. Now you’re going to open up your Pathfinder (if you can’t find it, go to the top menu and click Window > Pathfinder), select both of your new compound shapes (with the texture still over top of the type) and hit ‘Minus Front’. The result is one solid, grungy vector shape. Alternatively, there are great products out there like VectorPress & InkBlock for Adobe Illustrator which you can combine with some of the techniques in this tutorial to achieve results like the example above. 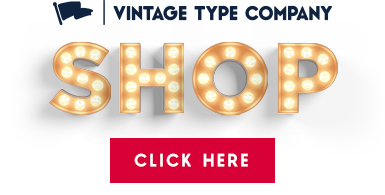 And that is one way to give your work a more hand-drawn, vintage feel with Adobe Illustrator. I hope you’ve learned something, and if you have feel free to subscribe to the newsletter to get stuff like this sent directly to your inbox. Thanks guys!